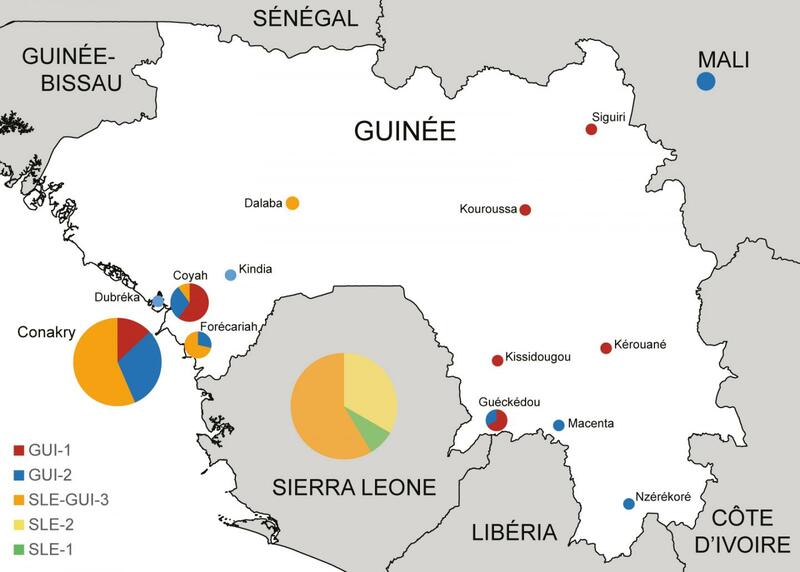 IMAGE: This is a map of Ebola virus variants circulating in Guinea and Sierra Leone. Sequencing the genome of Ebola virus strains circulating in Guinea has allowed scientists at the Institut Pasteur in Dakar and in Paris, the CNRS and the University of Sydney to retrace the spread of the virus and monitor its evolution in the country where the outbreak started. This research reveals the co-circulation in Guinea, particularly in the urban regions of the capital and neighboring towns, of three distinct variants of the virus whose mutations are described in an article published in Nature. Characterization of the genetic variations of the virus is crucial to ensure the continued efficacy of diagnostic tools and for the development of effective treatments and vaccines. The Ebola epidemic has been ongoing in West Africa for over a year, with 27,341 reported cases, of which 11,184 have been fatal (1). The source of the epidemic has been traced to a forested area in South-East Guinea, from where it rapidly spread to the capital, Conakry, and to neighboring countries. In March 2014, the Institut Pasteur of Dakar set up a mobile laboratory at Donka hospital (Conakry), to provide diagnostic services throughout Guinea. The involvement of volunteers from the Institut Pasteur and its network, in Conakry and other regions of Guinea such as Macenta, was constant during the entire epidemic. Monitoring the development of the Ebola virus genome is key for developing better treatment strategies, designing effective vaccines and ensuring the continued efficacy of diagnostic tools. To this end, scientists at the Institut Pasteur in Dakar and Paris, the CNRS and the University of Sydney contributed to the international efforts to combat the disease by characterizing the Ebola virus isolates circulating in Guinea between July and November 2014. Sequencing of the virus from rare samples containing only small amounts of biological material was optimized in a collaborative effort with scientists from the Broad Institute (Cambridge, USA), who were already deployed in Sierra Leone. Analysis of these sequences reveals the existence of three distinct variants of the virus co-circulating in Guinea, and a very different dynamic than that observed in Sierra Leone and Liberia. While this study highlights the genetic diversity of the viruses circulating in Guinea during the epidemic’s spread, it also shows that the mutation rate is well within the margins previously described for this type of virus. Monitoring viral variations is a strong complement to epidemiological studies retracing transmission chains, and will enable better targeting of response strategies in the face of potential new epidemics. Lastly, studies of the Ebola virus genetic variations, which have quickly been made available to the scientific community, will help optimize the treatments and vaccines under development. 3 Institut Pasteur in Dakar, Arbovirus and Viral Hemorrhagic Fever Unit, Dakar, Senegal. 4 National Institute of Public Health in Guinea, Conakry, Guinea. 5 Hemorrhagic Fever Project of Guinea, Gamal Abdel Nasser University, Conakry, Guinea. 7 Institut Pasteur, Environment and Infectious Risks Unit, Laboratory for Urgent Response to Biological Threats, 75724 Paris Cedex 15, France. † These authors contributed equally to the work. ‡ These authors jointly supervised this work.